FILE - This Friday, Nov. 9, 2018, photo shows Paramount Ranch, a frontier western town built as a movie set that appeared in countless movies and TV shows, after it was decimated by the Woolsey fire in Agoura Hills, California. Southern Californians faced with the loss of lives and homes in a huge wildfire are also grappling with the destruction of public lands popular with hikers, horseback riders and mountain bikers. When the Paramount movie ranch and Western Town burned in a wildfire that swept through Southern California, one woman lost more than a local historic site. Dianne Erskine-Hellrigel invited more than 500 people to her 1990 wedding at the Paramount Ranch. Her stuntmen friends provided the entertainment for her guests by falling off buildings and staging elaborate gunfights. A before photo is placed on the remains of a building leveled in the Woolsey Fire at decimated Paramount Ranch during U.S. Secretary of the Interior Ryan Zinke's visit to the ranch Thursday, Nov. 15, 2018, in Agoura Hills, California. 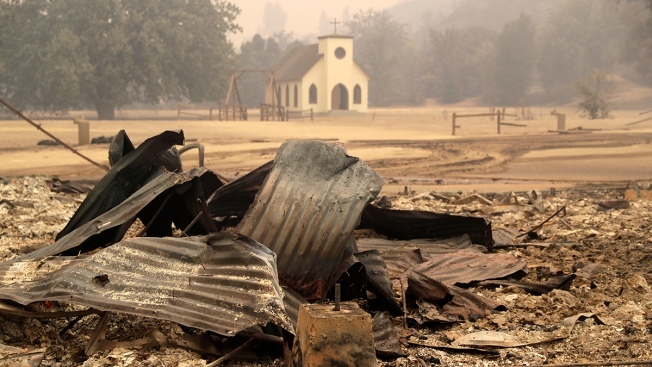 “The only thing that is left there is the little church,” Erskine-Hellrigel, the president and executive director of the Santa Clarita-based Community Hiking Club, said. “It was just the most magnificent place to have a wedding or an event. And it breaks my heart that it’s now gone. All those memories up in smoke." 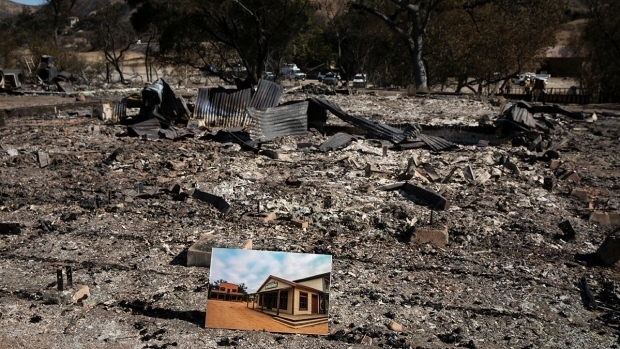 Paramount Ranch was just one of many recreation areas destroyed by two wildfires that swept Southern California throughout November 2018. It’s been three months since wildfires in the area were contained, but the state’s cleanup process is still in early stages. Many residents are concerned about the lasting damage to their national and state parks, as park officials estimate it could take 10 to 20 years for the land to fully recover. The Woolsey Fire spread across nearly 97,000 acres throughout Los Angeles and Ventura counties. It claimed three lives, according to the California Department of Forestry and Fire Protection’s website, destroyed 1,500 structures and damaged more than 340. The Hill Fire burned through an additional 4,500 acres in Ventura County but left behind little structural damage compared to the Woolsey Fire. The Woolsey Fire also heavily impacted state and national parks, many of which neighbor cities like Thousand Oaks, Malibu and Santa Monica. “Over 85 percent of what we call the national recreational area has burned,” said William Vanderberg, the vice chair of the Santa Monica Mountains Task Force of the Sierra Club’s Angeles Chapter. The Santa Monica Mountains National Recreation Area falls under the National Park Service’s jurisdiction. Paramount Ranch, Rancho Sierra Vista, Cheeseboro and Palo Comado Canyon, the Santa Monica Mountains Visitor Center and the Sandstone Peak trail have all reopened, but many other NPS parks remain closed. The National Parks Service did not respond to several requests for comment. Of the Santa Monica Mountains State Parks land, 55 percent was damaged, with the Leo Carrillo and Malibu Creek parks being the hardest hit, according to California State Parks officials. Much of Leo Carrillo’s campground, trail and day-use areas remain closed as the state parks departmentworks to clean debris and rebuild burned structures. 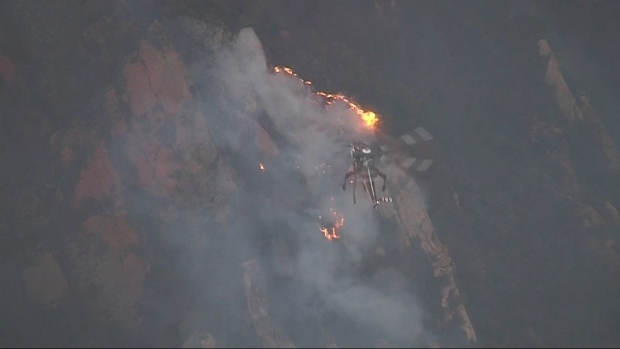 Malibu Creek’s campground also remains closed. The park also lost employee residences as well as some historical sites like the home of one of the state’s pioneer homesteaders, Pedro Sepulveda. Point Mugu State Park and the other state parks have been completely reopened to the public. Sap said not only did the parks suffer damage, but the organization’s facilities, support buildings, maintenance yard, office buildings and restroom facilities were also impacted. Local residents are reeling over how the damage done by the fires will affect their outdoor spaces. Vanderberg with the Sierra Club described a hike in Will Rogers State Historic Park in Los Angeles that goes down a canyon called Rustic Canyon. The remains of an old vacation home called the Murphy Ranch and a colony where people once lived lies at the bottom of the canyon. Vanderberg said local folklore claims that leading up to World War II, the abandoned ranch was once home to Nazi sympathizers who wanted to create their own colony in the canyon. This photo taken on an unknown date shows the National Park Service's Peter Strauss Ranch in Agoura Hills, California. The ranch, named after the Emmy Award-winning actor by the same name, has been the site of Johnny Cash and Willie Nelson performances. It burned down in the wildfires that swept Southern California in November 2018. It could be months or even years before evidence of the fires disappears. Vanderberg said that volunteer organizations, the National Park Service and the state’s Department of Parks and Recreations began the cleanup process in the beginning of December by beginning to walk the trails to assess the damage and hazards. This included clearing fallen tree limbs, removing trees that may fall in the future and moving dirt to prevent erosion. Sap, the state parks official, warned that rainstorms could still have massive effects on the recovering parks. Vandenberg added that the firefighters had already done some of the work of clearing trails so that their trucks could enter. But Vanderberg noted that it might take several months or even years to recreate all the trails that once crisscrossed the parks. One such case is the Backbone Trail. Vanderberg said the trail contains nearly 70 miles of trail in an urban area that stretch the length of the Santa Monica Mountains. It offers everything from ocean views to stops at the Hollywood sign. Vanderberg said it had been officially completed and dedicated as a National Recreation Trail just two years ago. The Woolsey Fire in Los Angeles and Ventura Counties has burned over 83,000 acres and is only 10% contained. “It’s the combination of 40 years of effort in acquiring property, in building these trails that connect the entire trail system,” Vanderberg said. “And people have been really drawn to it this past year or two as word has gotten out that it had been completed, well that’s going to be significantly impacted for a long time." Santa Monica Mountain Trails Council President Ruth Gerson said three of the trail’s major bridges have been destroyed. Gerson rode the length of the Backbone Trail on horseback two years ago when she was 83 years old. Sap said that although he has an overall budget of $10 million for his district, the district will require more funding from the state Parks and Recreation Department and the federal government. While recovery efforts keep most of part of the state parks closed, Will Rogers and the Topanga park northwest of it remain completely open to public use. 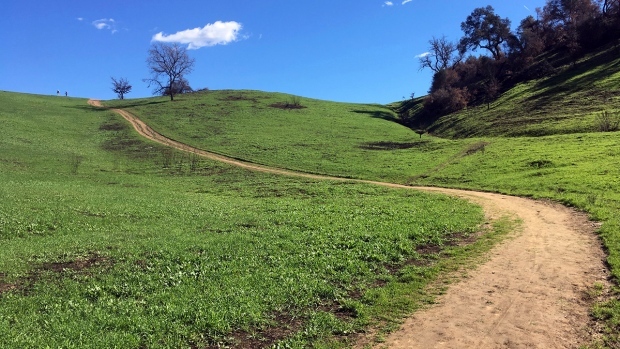 Steve Iland, who plans the hikes for the Community Hiking Club in Santa Clarita, fears that because so many parks remain closed either partially or completely, more people will crowd to a select few parks. Iland said even if some of the burned areas were to reopen, they might not be much use to hikers. He said the section of Malibu Creek State Park where “M.A.S.H,” the 1970s Vietnam War-inspired television show was filmed, once contained exotic trees and plenty of shade before the fire. Most of that shade is gone now. ”For the general public who wants to go to the woods and escape, the woods are gone,” Vanderberg said. Kate Van Waes, the executive director of an advocacy group for hikers called American Hiking, believes the loss of scenery could affect visitation to the parks. But the scorched earth hasn’t stopped Gerson, the Santa Monica Mountain Trails Council president, from visiting Paramount Ranch, which has been reopened. She decided to stay in her home near the park, despite a mandatory evacuation, to watch over the 25 horses that evacuated neighbors and friends entrusted her. Gerson prefers to go with her horse to Malibu Creek State Park, which remains partially closed, but she’s settled for Paramount Ranch. This Jan. 21, 2019, photo shows a section of land that burned in the Woolsey wildfire at Malibu Creek State Park near Calabasas, California, now covered in new, green grasses after a series of rainstorms. Erskine-Hellrigel, the hiking club president, said that people should be on the lookout for other examples of California’s “really interesting” fire ecology. She described how oak trees that are burned down to the ground will stump sprout, meaning it will grow back with multiple trunks fused together. The “magnificent trees” with two, five or eight different trunks are often evidence of a past fire. Erskine-Hellrigel also said there will be Poodle Dog bushes after the land recovers, and they’ll last for about eight years. Sap said that visitors tend to flock to parks to take pictures of the wildflowers and plants that emerge like phoenixes from the fire. He also said the California Department of Parks and Recreation learned a valuable lesson from the 2013 Spring Fire, which burned more than 80 percent of Point Mugu State Park. Despite wildfire and flooding damage, people stormed the park when it reopened after a month. “I think we’re going to see a similar situation here, you multiply that one park times three, the big parks within the Los Angeles district and the Malibu sector primarily, that people really want to get out there and recreate,” Sap said.